This integration with Outlook helps you to keep track of emails sent to the contacts available inside Aritic PinPoint. After the successful integration, you would be able to sync the emails from your Outlook mailbox to Aritic PinPoint. The email conversation history and the time-line is available under the contact’s engagement tab inside Aritic PinPoint. 1. Settings > Plugin > Mailbox > Outlook inside Aritic PinPoint and click on the Outlook icon. 2. Inside this popup enter a secret or key of your own inside “Outlook Add-in Secret”, this will help to validate the Outlook Add-In. This secret key ours should be only alpha-bates without any space or symbols. 3. Install this Aritic PinPoint Outlook Add-in for Outlook 2013/2016 on your windows machine. 4. 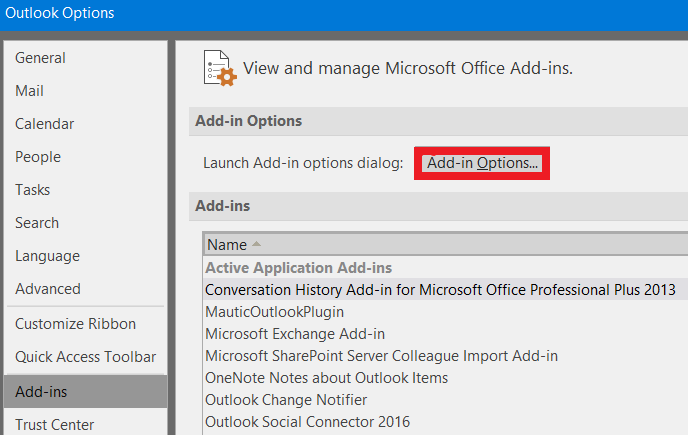 After above installation completes, navigate inside your Outlook 2016 Options window, then select Add-Ins and click on the Add-In Options button. 5. On next screen type in the URL of your Aritic PinPoint application inside “Aritic URL” field, add the same secret key which you used in the above 2nd step and click OK.
6. Now, to track an email sent to a contact, click the “Track Email” button from top ribbon on the New Email window of your Outlook. After that, Aritic PinPoint will validate the information using the secret key to compare signatures and then it will automatically attach that email to the contact’s profile as part of their engagement activity history inside Aritic PinPoint. If the contact/ lead don’t exist, they will be created automatically inside contacts.